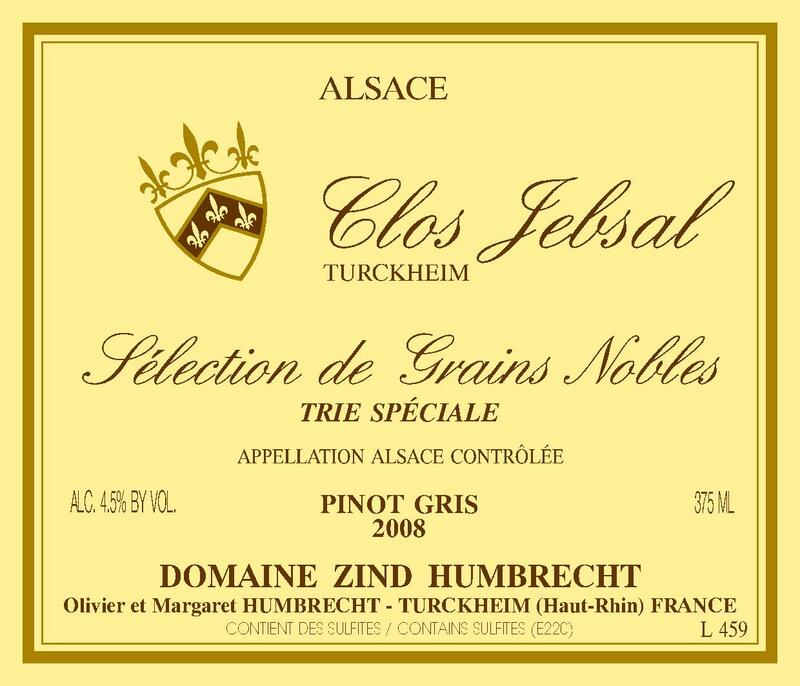 I do not believe that there is another vineyard in Alsace capable to so consistently produce late harvest style wines of such richness. It really is in the nature of the Clos Jebsal to allow noble rot and force us to harvest grapes with huge richness potential. The fantastic grey/green marl mixed with the gypsum rock (Jebsal is the place of Gypsum) provides the mineral frame and the structure necessary to carry so much richness and residual sugars. In exceptional years with great acidity potential like 2008, a normal SGN selection, without having to be more severe in selecting the berries, ends up with potential alcohol well above 30% (that is if all the sugar ferment through, the wine would have more than 30% alcohol). Something happens with the yeasts at such richness that the fermentation takes years to reach only 4 or 5% alcohol, leaving a huge sweetness in the wine. At these concentrations, the osmotic pressure on the membrane of the yeast is such that it must literally explode after a few days of existence. Imagine the state of our skin if we would be buried in a barrel of sugar! Today, this wine is still fermenting, very slowly, in two small 600l new casks. We have no idea when it will be finished! 2/2010: I am not sure if it makes sense to comment this wine today while still bubbling slowly. The aromas are still extremely sugary, honeyed, macerated green apples with some fermenting character. It is actually a very elegant nose, but by far not accomplished yet. The palate is much more interesting today, even if fermentation isn’t finished, I doubt that there will be big changes before the end. The acidity must be unbelievable as it totally masters the sweetness. The mouth texture is very rich, creamy, honeyed. The wine pours like olive oil, but still has a very pale and clear colour. A work in progress, but very interesting at this stage.